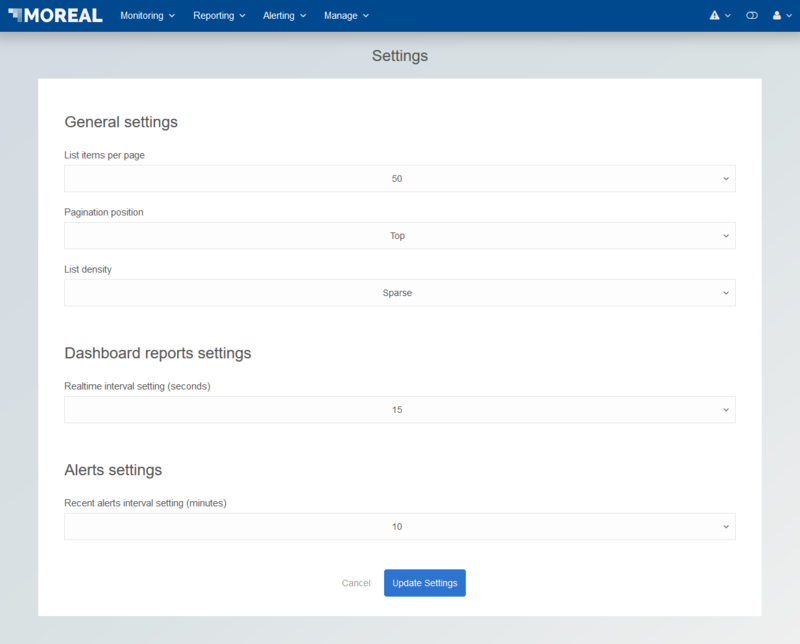 MOREAL can be personalized through the Settings page depending on user preference. The List items per page setting specifies how many list items will appear in every list page throughout the MOREAL platform. The selected number of list items also defines the number of list pages – the higher the number, the smaller the number of pages the results are divided into. This setting allows for the Pagination navigation to be positioned either Above, Below or both Above and Below the list items. This settings changes how dense the lists appear. Sparse density is easier on the eye, but dense lists tend to fit more list items on screen. The Realtime Interval Settings defines at what interval the report charts are updated in the Dashboard.